I read somewhere “You don’t have to cook fancy or complicated masterpiece – just good food from fresh ingredients.” This is my mantra when it comes to Mia’s food just few fresh ingredients and I can rest my mind. 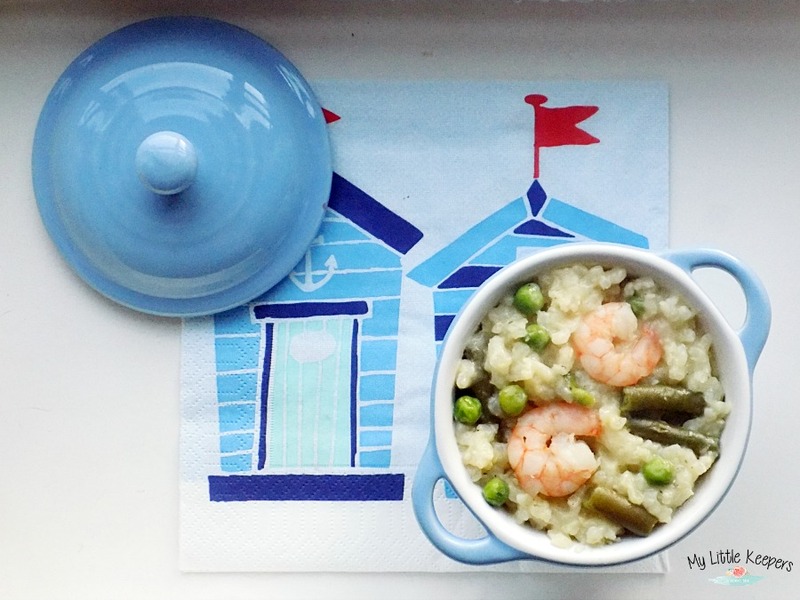 Today we have Prawns and French Beans Risotto (easy to make and delicious – recipe below) this is second time Mia has prawns and it seems she likes them. Heat the oil in a large, non-stick saucepan over a medium heat. Add the onion and garlic and fry for 2-3 minutes, stirring occasionally, until softened and just beginning to colour. Add the risotto rice to the pan and stir well for 30-40 seconds, until the oil has coated the grains of rice. Pour in half of the water and allow to bubble for 30-40 seconds, then add all of the stock and bring to the boil, stirring well. Reduce the heat and simmer, uncovered, for 10-15 minutes, stirring frequently, until the rice is almost tender and the risotto is creamy in appearance. Stir in the prowns, frozen peas and French beans then continue to cook, stirring constantly, for a further 4-5 minutes, or until the prowns and french beans are heated through and the rice is tender with a slight bite. Remove the pan from the heat, then stir in the butter and if you like some cheese (cheddar or parmigiano).